A turn based strategy mixed with a trading card game. 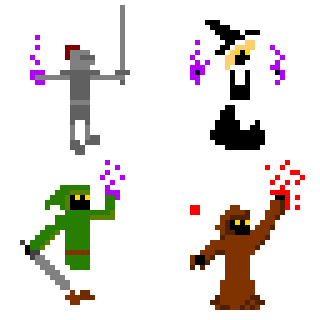 Collect cards to add to your grimoire, and summon them in battle to defeat your opponent. I usually post news on Summongame.tumblr.com , but I figure I shouldn't neglect this page either. 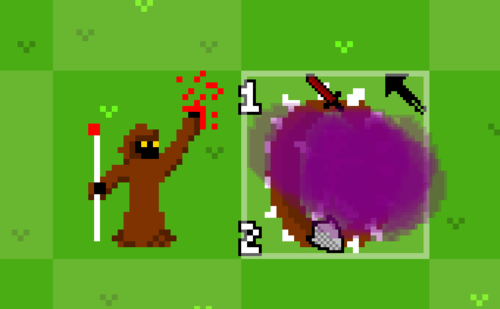 One of the major things that I added was a buff/debuff system. At the moment the positive effect is called boon and the negative affliction, but I'll probably change the names at some point. Each unit has a default value for their attack, defence, movement range, ability range and attack range. Normally, at the beginning of your turn, your unit's stats will reset back to their defaults, aside from your summoner, who's defence stays the same. What the buff/debuff do is, if a unit has, say, boon, it's stats won't decrease if they are above their default values at the beginning of your turn, and the opposite if the unit has affliction. A unit can have both, and this just means that none of their stats reset. They last for a number of turns, as indicated by the yellow and green numbers beside the unit. Currently, they stack additively, so units like the bloated zombie, which can put 2 turns of affliction on a unit, can effectively disable units. I'm worried that it might be a bit overpowered though, since you could, for example, get a lot of turns of boon on a wheel skeleton or cassowary knight, which both gain attack power each time they move, and run around the map until they have an obscene amount of attack and 1 shot the opponent's summoner. Maybe that should be a valid strategy though. Another thing that I did was write a png-to-map loader. 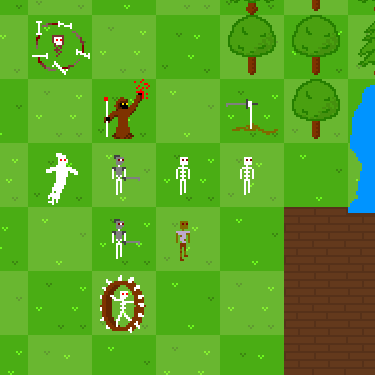 I figured it was easier just to draw maps in paint than writing a proper map editor, though I might make one later. The map loader automatically puts edges and stuff correctly. Alongside the map editor, I changed the way maps were handled, in order to increase the types of terrain that were possible. Before, terrain basically acted as another unit on the map, so it wasn't possible to have a unit and a terrain object on the same tile. Now, the terrain and the units are stored in 2 different arrays, so while you still can't have 2 terrain objects or 2 units on the same tile (which, for now at least, I don't want) you can have a unit and a terrain object on the same tile. This enables things like bridges to exist. It also lets me implement flying, and possibly swimming, units. Also, terrain such as trees and wooden bridges will be destroyable, so if you want, you could take out a bridge to force your opponent to take a longer route around the map, or cut your way though the trees to make a shortcut. 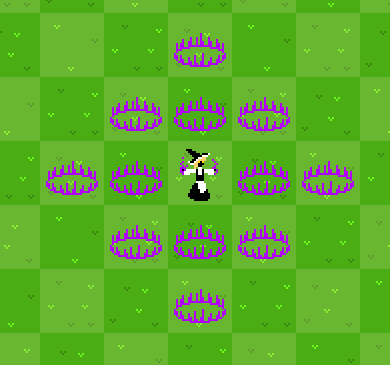 As well as adding a new array for terrain, I added one for effects as well. This can include things such as a delayed blast of damage, or something that slows units within down. This was especially important for the shrine maiden deck, since it revolves around putting a lot of effects on the field. I "finished" the necromancer deck too. I might do a seperate post for all the card listings, but basically, the zombie and skeleton units spawn a weaker unit when they die, making it hard to push past a defensive line of them. Theres also the spookygeist, which can only be damaged by spells, the wheel skeleton, which gains attack power when it moves, the skookymagist, who can summon weak skeletons every turn, the bloated zombie, which can inflict affliction on units, and the whirlwind skeleton, which can damage all units nearby, plus a few other cards. One of the ways I aim to restrict the players' available cards is by limiting access based on their class. Not all cards in a deck will be limited to their respective class, eg any class can (probably) use spookygeists, but only necromancers will be able to use spookymagists. The restrictions will mostly be limited to core cards in the decks, eg raising the dead should be limited to necromancers. Each class has different stats and abilities, for example the necromancer class can summon a cheap skeleton each turn for 1 mana, without needing to use a skeleton card, and the commander class can give a unit a turn of boon. While classes are working in summon, there's not actually any way for the player to select them yet. This was visible in another screenshot that I posted, but it wasn't the main focus. I think I've got a decent design for the cards, the only thing it doesn't show at the moment is the cards ability/effects. I'll probably change the background colour of cards that have an ability and display the ability somewhere else on the interface. I fixed the range indicators up a bit. 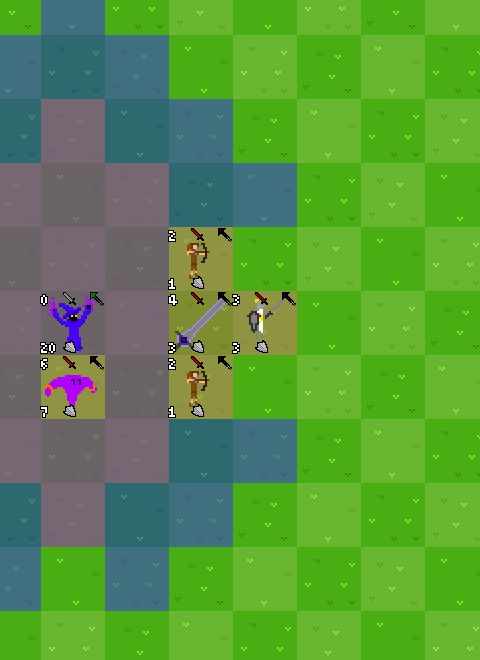 Previously, when you selected a spell to cast, it wouldn't show the range properly, and now it does. Also, when you hold down shift to use a unit's ability, the range indicator for that unit change appropriately. 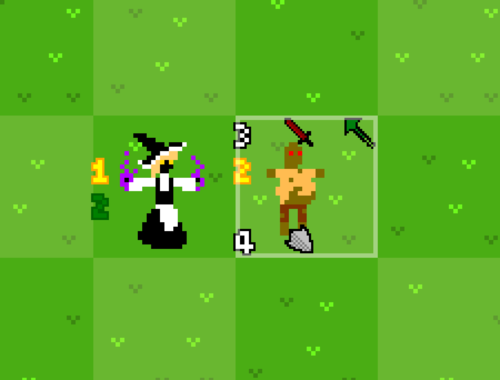 I don't think I mentioned this in any previous posts, but I added a ability range stat to units, so that it can be separate from their attack range. So for example, the bloated zombie can hit units with its ability from 2 tiles away, but can only attack them if they are next to it. Summoners now also can summon units anywhere within their ability range. Previously it was within their attack range, but that meant classes like the commander, who has a sword, would either have a strange attack range, or only be able to summon units right next to them. Added terrain / loading maps from .pngs, optimised code, cleaned up user interface.